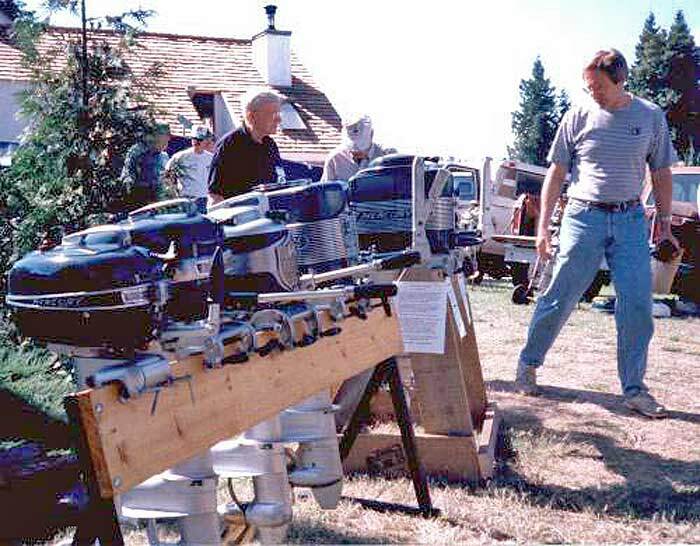 1997 INTERNATIONAL ANTIQUE OUTBOARD MEET! 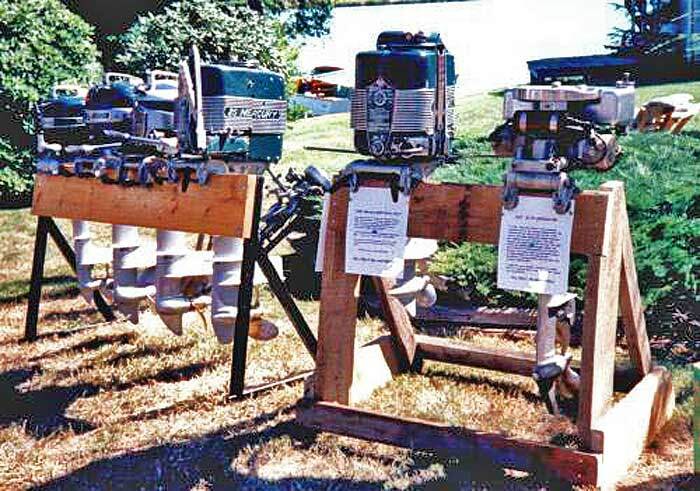 1999 NATIONAL ANTIQUE OUTBOARD MEET! 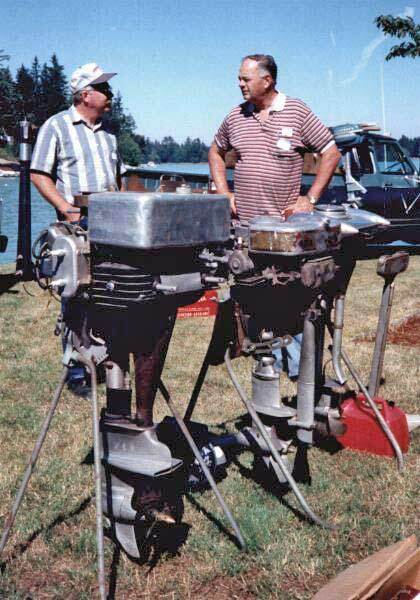 2003 INTERNATIONAL ANTIQUE OUTBOARD MEET! CLICK ON THE LINKS BELOW TO SEE THE COOLEST OLD MOTOR STUFF ON THE WEB. 2009 LAKE SHIPP FLORIDA ANTIQUE OUTBOARD MEET PHOTOS! WANTED, DEAD OR ALIVE. HAVE YOU SEEN IT? GOT A QUESTION ABOUT ANTIQUE OUTBOARDING? This is a pretty old meet report, I have left it up in memoriam as we are no longer able to use this beautiful spot, owner-member Bob Sperring has passed away. Carl Kiekhaefer's MERCURYS outshone 'em all! It was a great day for the green Machines! Phil Brooke Jr. from Spokane, and his son Doug (RT) check out those Mercs & stuff! Doug has had dies built and manufactured new gasket sets for the older KF & KG series Mercs, as well as the Mark 50. 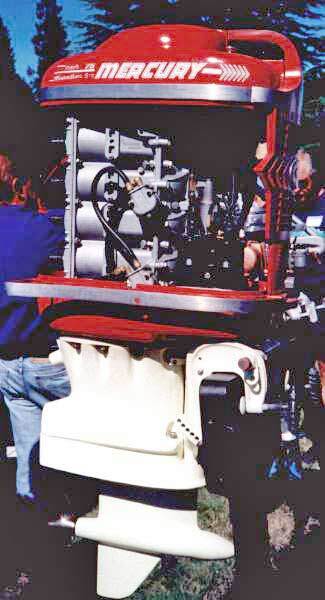 He has also reproduced old Johnson opposed head gaskets, as well as for the OMC 4-60. Call him at 509-747-0517. 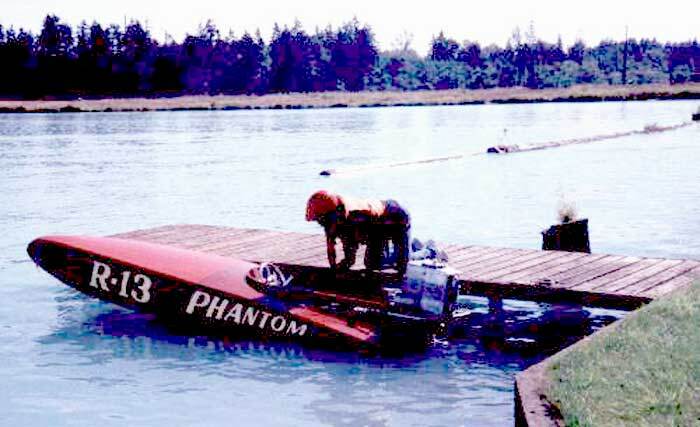 Phil Williams and his son Charlie own "PHILS PERFORMAX MARINE" in Puyallup, WA. Charlie has been trained well. He and his dad have an incredible Merc collection, would you believe they have TEN 20H's? (yes,10) Dad still races classic C and C service with the Speeditwins & PR's. That 20H is original and stock. They ran it around all day along with the KG4 pictured above. A 1930's PHANTOM! Once upon a time this boat was mine - - I sold it to Bob Haynes 10 years ago when storage of 150 motors and 6 boats ecame more than I could afford, as I now live most of the time in Hawaii. He has impeccably restored it to better than new. Now I can enjoy it and not have to be responsible!! (But I still wish I had it!). These boats will still run competitively today in "C". Amazing! OK so there were some other heavy hardware types at the meet. Mike Hansen brought this rare '34 ELTO Big 4 60 cubic inch "eggfryer" so called as the tops of the cylinders get VERY hot, they have no cooling there! Member Jack Dumont from Canada (RT) converses with an unidentified fan. An Impeccably restored '28 Evinrude Fastwin.Built by the competitor to Ole Evinrude's ELTOs. These 2 beauties run as good as they look! A Neptune 16 and an early "A" Johnson.This was a really fun day for all who participated. If you have any older boating equipment, or are just fascinated by old stuff, you might want to get involved. 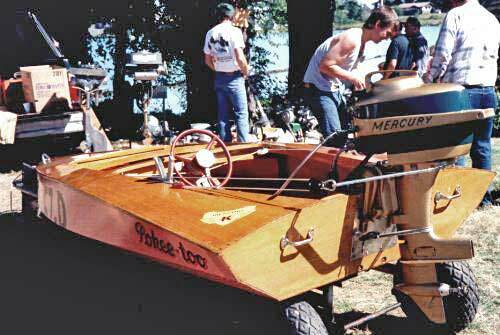 The vintage motors are inexpensive, reliable and boating can be fun. There is always someone willing to help you to enjoy the hobby. get with us!